What was I saying about the recent batch of celebrity-owned gear on eBay? I don't know what the seller was thinking putting Duke's situation out there for all and sundry to read -- as if that extra bit of 'persuasion' was needed to sell this guitar. It's well-meaning but undignified. This is Duke Robillard's guitar! But back to the guitar. In Duke's own words, "This is a really nice Esquire....it has a great chunky neck on it. I added brass compensated saddles so I could get perfect intonation. I had a Fralin hot Tele pickup put in...it really cuts! The high-end gloss finish is rare in this model...this finish looks authentic to the 50's. 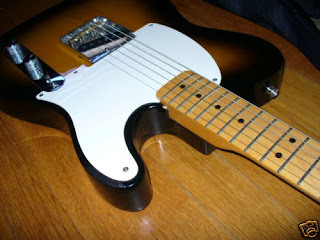 Really nice Tele!....great for playing the blues with these taller frets (6105)....it's a bright sounding guitar!" With a Buy It Now price of $729, a beginning collector can cop a bit of the Robillard mojo. Or at the very least, own a really neat conversation piece. All the Best to you, Duke. You taught me a thing or two. I wanted to let you know of a new project we are working on that I am sure you will be hearing about. 100% pure quartz crystal frets! This is VERY interesting. Any update on the patent application? Just to let you all know, that particular Esquire ended up in Portugal, in my house. 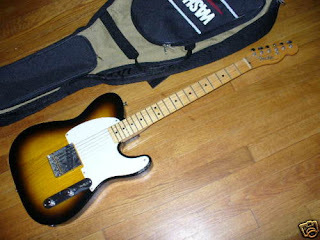 I take really good care of it and gig it frequently playing the blues with my band. Only thing I did to it was to swap the white pickguard for a black one, looks cooler like that to my eye. That's awesome Pete -- enjoy your piece of blues history!